This charming cottage was so homey and clean. Spent a lot of time out during the day, but looked forward to returning to the cottage for some R & R. I will be looking forward to my next trip! Enjoyed a quick winter getaway in Rockport. Periwinkle cottage was a perfect spot. Quick walk into town and all the amenities one needs. Periwinkle cottage was very cute and extremely clean. Loved the loft style bedroom and the kitchenette worked perfectly. Rosemarie was a very gracious host and made it a point to make sure everything was perfect. It was a Beautiful, Cozy space, where one or a couple can take sometime to be alone whether you stay In or enjoy what the town has to offer. 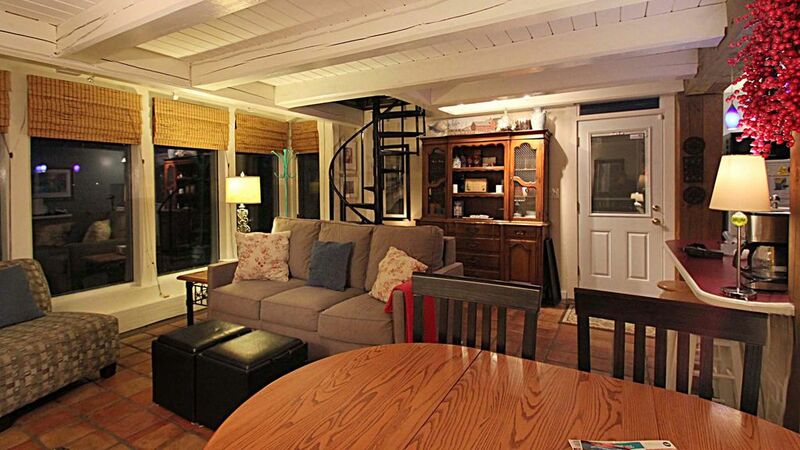 The cottage was amazingly comfortable for two, beautifully decorated and very clean. Wonderful if you want to stay in and prepared your own meals, but also closed enough to downtown to shop look at other activities or enjoy great places to eat. I would recommend this warm place to anyone anytime of the year. Periwinke Cottage #2 is a delightful retreat, in a quiet residential area, just a short walk to the village. Charming decor, lots of natural light and comfortable bed and seating added to the ambience of the home. Although we arrived late on a cold winter's night, we dove right into the provided cookies and hot chocolate. Other little treats were to be found in the refrigerator and about the cottage. The kitchenette is well equipped with everything you might need. The hostess was professional and quick to respond to our initial inquiries. She more than exceeded our expectations as many other reviewers indicated. The only caveat I would offer is that if you are handicapped or a very large person, the spiral staircase to the second floor with the bathroom and bedroom, may be difficult to navigate. We will definitely return to Periwinkle Cottage #2 in the future. This little cottage was cozy and comfortable in a quiet neighborhood. EVERYTHING you needed or wanted was there! Loads of info about things to do and the owner was available at all times to help out in any way. We will definitely use this property again. This was a perfect little cottage. Just the place to relax and enjoy Rockport and the area. Quiet neighborhood and the cottage had EVERYTHING you could possibly want and MORE!! We will definitely return!! INSTANT BOOKING: if you (the traveler/guest) does not meet the stated House Rules, Policies, Terms and Conditions and Rates noted for that time of year your reservation will be canceled. Sleeps 2 guests only. Unit is not able to accommodate infants or children under 16 years of age. A Holiday stay pays a premium and is the weekend rate plus an additional $25-night. Please see Holiday's Observed on our website. If a 1-night stay is available on the calendar - please call us directly to reserve your stay. Property monitored by security cameras on the outside of property only. No pets of any kind, non smoking only. Rates subject to change without notice. Arrival time is 3:00 pm and Departure time is 10:00 am. The calendar is up-to-date, however, we may not be able to accommodate a last minute/same day reservation. Please inquire through this site about availability. PLEASE NOTE: We only reserve stays with a valid credit card only - no checks or wire transfers accepted. Thank you! Property not suitable for large gatherings, wedding parties, etc.